multi-camera | I'm not stalking you. 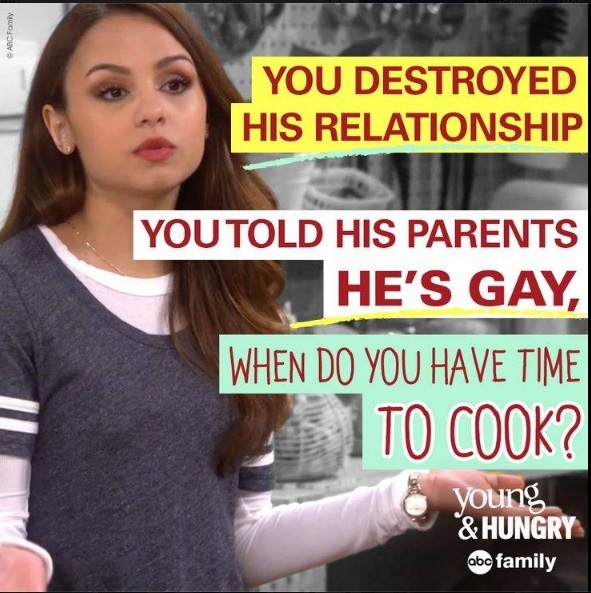 A few months ago on Netflix, I stumbled upon a show called Young & Hungry. I may have skipped over it completely, until I saw that it starred Emily Osment. I always enjoyed her as the sidekick on Hannah Montana (yes, I am an adult who watched Hannah Montana. Deal with it.). I actually always liked her character of Lilly better than Hannah. 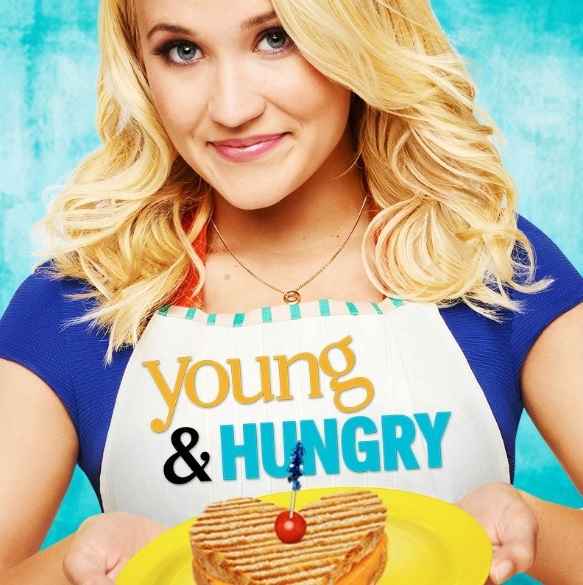 I gave Young & Hungry a try, and I am so glad I did. If you are looking for a realistic, deep, intellectual drama… ya, keep walking. But if you just want a little bit of marshmallow fluff to make you smile at the end of a rough day, this show is for you. It is a multi-camera sitcom in the tradition of humor based on misunderstandings, the type that no longer exist on the big 5 television networks. I love that by reading one word in the episode title, I can guess the plot of the whole ensuing episode pretty spot-on. That brings me great joy. It is the only show that has made me literally laugh out loud in a really long time. And yes, much of the humor is based off of stereotypes, but I think it is done in a way that doesn’t come off as offensive as many other shows. The basis of the show is that Gabi (Osment) is a young and poor girl who is good at cooking and desperately needs a job. She interviews to be a personal chef for a wealthy, successful tech developer named Josh (Jonathan Sadowski). They discover that they have a bit of chemistry. They sleep together, then realize it is a mistake for several reasons. And then he hires her anyway. And, that my little friends, is THE PILOT. Yes, they go THERE in the pilot. The ensuing episodes all have a standalone plot, while the overarching theme of the series is always “When will Gabi and Josh get together as a couple?” Which, unfortunately, is something I totally fall for. The supporting cast is great, and one that makes you believe that old sitcom falsehood of “they are all one big, happy family,” even though they bicker with each other. It is a very diverse cast. And the actors mesh together so that I actually believe they might all talk to each other if they were in the real world. There is Kym Whitley playing the strong, outspoken black woman. There is Rex Lee playing the gay Asian who bosses everyone around, but is actually quite insecure when not involved in his job. I LOVE Aimee Carrero as Gabi’s roommate Sophia. She gets some of the best lines. I loved it when Gabi was going to set up an online dating profile against her wishes and stated that her name, “Sofia Maria Consuela Rafaella Rodriguez,” would be an auto-correct nightmare. Aimee Carrero as Gabi’s roommate Sophia. I love it when Gabi’s car breaks down, so Josh figures he will remedy the situation by buying her a new used car. And his other employees Yolanda and Elliot are like “What about us? Where are our new cars? “Or when Gabi thinks she may be pregnant. And she has only slept with Josh. And apparently the only place she can take her preg test is at work at Josh’s apartment?!? Hi-jinks and confusion ensue. This show is currently in the middle of its second season on ABC Family. You can check out past episodes on Netflix. And it is a show that, with my brilliant synopsis above, you could join in the fun at anytime. Just know that as the season comes closer to an end, the writers will give you the illusion that Josh and Gabi are getting closer to a real romantic relationship. Then they will find a way to RIP it away from you! (That is what happened at the end of season one, and before the mid-season two hiatus.) But, the show is so cute and funny, you will find that you will come back for more anyway. Don’t forget I have a NEW CONTEST running where you can win a pair of passes to the GREAT LAKES BOOK BASH October 10th in Kalamazoo, MI. Winner provides own transportation and/or lodging. See contest for complete rules. Hurry! Contest ends September 15, 2015. Posted in Entertainment Worship & Review and tagged ABC Family, Aimee Carrero, comedy, Emily Osment, Jonathan Sadowski, misunderstandings, multi-camera, romantic, sitcom, televison, Young & Hungry. Bookmark the permalink.